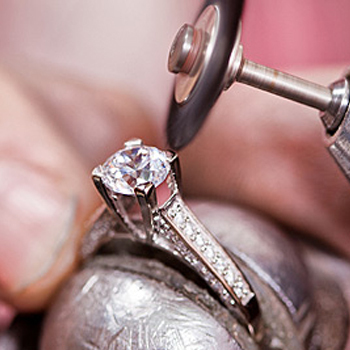 Diamond & colored stone setting & expert jewelry repair by a jeweler with over 30 yrs experience including but not limited to ring sizing of karat, silver & platinum rings, re-tipping or replacing of prongs, chain & bracelet repair, ring solder & hand wax carving for anything from a custom fit wedding band to custom made hering, charm soldering as well as restoration & refurbishing of rings, pendants, etc. Custom designing including metal/wire fabrication & hand wax carving for anything from a custom fit wedding band to custom made heads for odd-shaped stones. Free design consultation for our CAD-CAM designing where the sky is the limit. Watch band shortening & battery replacement. Convenient parking behind the store specifically for our customers.